as well as receive signal gain. the transmit power amplification as well as receive signal gain. and to compensate for cable loss in certain installations. 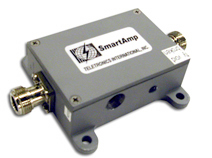 Product Note: The Amplifiers listed on this page may also be referred to as: 2.4GHz amplifier, 2.4GHz amp, 2.4 amplifier, 2.4GHz signal booster, 802.11 amplifier, 802.11b amplifier, 802.11g amplifier, 802.11b/g amplifier, 802.11 signal booster, 802.11b signal booster, 802.11g signal booster, 802.11b/g signal booster, antenna booster, AGC amplifier, antenna amplifier, Bi-directional amplifier, bidirectional amplifier, hotspot amplifier, integrated amplifier, PoE amplifier, RF amplifier, RF power amplifier, RF signal amplifier, video amplifier, wifi amplifier, wi-fi® amplifier, wireless amplifier, wireless LAN amplifier, and wlan amplifier.